You’ve heard that exercising with a friend is beneficial because you are accountable to someone else, and less likely to skip a workout. Not to mention the social nature of having a workout buddy. But finding someone with the same schedule as you on a day to day basis is nearly impossible. Well, look no further than your own feet, where your faithful, furry companion is most likely sitting. Take advantage of this always-available four-legged friend and you will both be happier and healthier as a result. 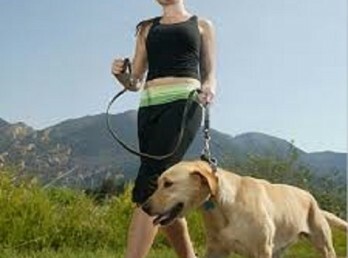 The most basic activity to share with your dog is a regular walk. If your dog is cooped up in the house while you are at work sitting at a desk all day, this is especially important for both of you. Want to take it to the next level? Include a run on alternating days, or for a portion of the distance. Be sure Fido is physically able to run (small or elderly dogs might be better off walking). Playing Frisbee together is another activity to consider. The running, jumping and throwing can offer a great cardio and plyometric workout (for both of you!). The game might be a bit one-sided, but you will still get the benefit of the activity. If Frisbee is not your thing, catch with a stick or ball will work well, too. Are water sports more your thing? Even paddle boarding, canoeing and kayaking are more fun with a furry friend. And because balance is important for these activities, having Fido along will engage your core more as you try to stay balanced with an unpredictable partner sharing your space. While your human best friend or neighbor might cancel on your regular fitness plans for any number of reasons, your furry companion is unlikely to ever pass up the opportunity to join you for a frolic outdoors. And if you decide to skip a workout, be prepared for those big, sad puppy dog eyes that might make you think twice.